Prior to 1701 the Stradivari workshop built cellos of large dimensions, in keeping with standards that had been established and sustained in Cremona by the Amati family for three generations. Only a few of the large form Amati cellos have survived unaltered. Of the 25 pre-1702 Stradivari cellos known today, only the “Medici” (1690) now residing in the Instituto Cherubini of Florence, the “Castelbarco” (1697), housed at the Library of Congress in Washington D.C., and the “Servais” (1701) at the Smithsonian remain intact with their original dimensions. That so many of the surviving Cremonese cellos have been reduced in size at one time or another has more to do with changes in musical style than with any flaw in the concept of construction. The innovative independent bass lines of the baroque style followed a long period in which the cello served the musical function of bass alone in the absence of a double bass. Large-form cellos built in Cremona prior to 1700 would have provided a highly desirable, deep and colorful foundation for an ensemble alongside the now–extinct “violone,” with which they shared octaves.1 Without the support of a double bass, pre-1700 musical demands necessarily excluded more florid bass lines. For that purpose, tastes in cello qualities quite naturally favored tonal richness and support over a shorter size and stop length with the resultant ease in playing. By the beginning of the 18th century the evolving orchestral style increasingly included the double bass, which provided extra sonority for an ensemble an octave below the cello line.2 This extra bass support freed up the cello part to take on a more complex role in ensembles. A consequent heightened expectation of speed and virtuosity from cellists then and since must have led to both the alteration of preexisting instruments and the development of smaller forms. 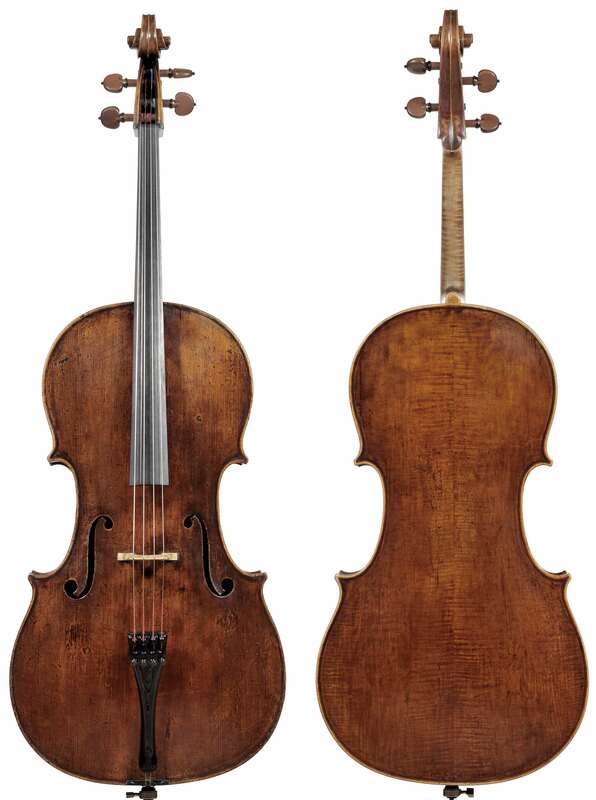 Stradivari’s Cremonese contemporaries, Andrea Guarneri and Francesco Rugeri, had already begun to respond to the demand for smaller form cellos by the 1690s3 with cellos of just over 71 cm in length. Stradivari’s response to these changing demands for cellos was more gradual; while the “Cristiani” cello is smaller than its predecessors, it is still larger than later Stradivari productions.4 While not yet a finished concept for Stradivari, the Cristiani’s body length of 76.6 cm marks a radical shift in concept from the 79.25 cm body length found on the Medici cello of 1690. Stradivari’s experimental change to the form of the Cristiani cello was a portent of both a sharp move away from larger forms and of more radical changes to the form of the cello to come. While the “Servais” of 1701 represents a momentary step back toward the larger form, as the “Servais” is the last known large form Stradivari cello, from this point on the advantages of a more compact cello form prevail. 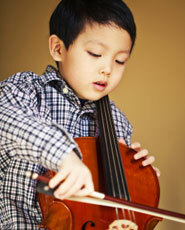 Many of the most important “forma B” cellos have played an integral role in the legacies of top performers. The “Davidoff” of 1712 has been heard all over the world, most recently in the hands of cellist Yo Yo Ma and previously as the primary concert instrument of the late Jacqueline Du Pre. In addition to the reputed distinction of having Napolean’s spur marks on the ribs 7, the “Duport” of 1711 was the favorite instrument of the late Mstislav Rostropovich. 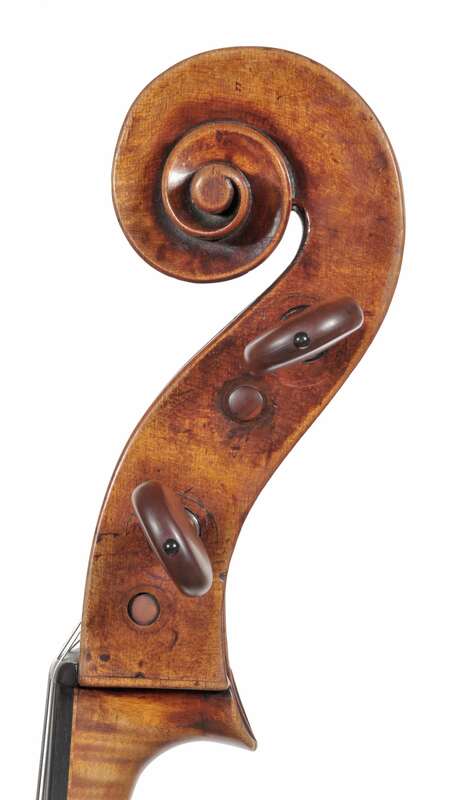 In a testament to the enduring supremacy of the “forma B design,” the great French luthier, J.B. Vuillaume used the “Duport” as the model for many of his cellos. From 1707 the Stradivari workshop appears not to have deviated from the “forma B” model until the late 1720s when we see a small number of cellos of an even smaller size known as the “forma B picola”8 from a mold so notated by Stradivari. The “De Munck,” cello made circa 1730, once owned by the legendary cellist Emanuel Feurmann, owes its slender appearance to the narrower “forma B picola” model. The narrow shape provides for great ease of shifting in the higher positions. Famed cellist and teacher William Pleeth performed much of his career on a Stradivari cello with a “sotto disciplina” label of 1732. Built on a short version of the forma B, the “Pleeth” is somewhat square in appearance. The “Josefowitz” cello circa 1732, is similar to the “Pleeth” but is still a full inch shorter than any other known examples, leading us to wonder if the “Josefowitz” was perhaps a special commission. From the size and the unusual placement of the fully intact f-holes, we can surmise that the impressive instrument pictured here—the 1693 ”Bonnet“ Stradivari—began life as a characteristic example of a 1690’s instrument of the largest possible dimensions. As with the majority of large Stradivari and Amati cellos, at some point during its life its overall dimensions were reduced from the original to facilitate use in evolving performance practice. In the absence of any record of who might have done the actual work we can only offer observations about some of the choices that informed the alterations. The most common method by which one would reduce the size of such an instrument would involve first disassembling the whole cello, and then separating the center joint on the top and on the back to allow material to be removed at the center before rejoining the halves. This method would have left the perimeter more or less undisturbed in the center (the upper and lower bouts would be reduced to effect the new length), and the f-hole placement closer together than the original design of the instrument. The reduction on the cello pictured here was handled differently: rather than removing material in the middle, material was taken from the perimeter, thereby preserving the center joint and the relationship of the f-holes which, as a result, look proportionately large and far apart on the now-reduced body. The remaining size, shape, and placement relative to the center, of the f’s are typical of the full sized, pre-1700 cellos. Consistent with other early-period Stradivari cello scrolls, this example is at once majestic and elegant, with a fullness and masculinity that corresponds to the original grand dimensions of the body of the instrument as it was originally built. While the forma B cellos generally have backs of maple cut on the quarter, the choice of maple cut on the slab for the back of this one is typical for the early period. The top is of spruce of medium grain and the ribs and scroll of plainer maple. The varnish is of a brown-orange color. As a playing tool this cello is among the very best we have encountered. Even among Stradivari cellos it is a standout, with unsurpassed complexity and richness, and a thrilling, visceral power. The alterations to its size leave it physically manageable and the combination of tone and playability is as remarkable as it is rare.